38. – 785.) 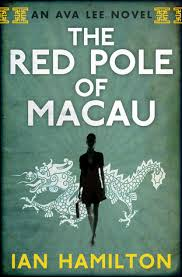 The Red Pole of Macau by Ian Hamilton – Having just resolved an art related case, Ava Lee, Toronto based forensic accountant and debt recovery specialist is looking forward to some quiet time when she gets an urgent call from her half-brother, Michael, in Hong Kong who is deep financial trouble. Ava’s father, Marcus, has not settled for one wife. Following a tradition for wealthy Chinese buseinessmen he has openly married a second and a third wife. Each has provided him with children. He meets the financial needs of all of the wives and children. Only in inheritance do the children of the first marriage have an advantage. Most, if not all, the estate will go to them. Ava is a child from the second marriage. In earlier books the complex family relationship is discussed but does not really play a role in the series. In this book family obligations form the core of the plot. While Ava has no responsibility to her half-brother there is a familial duty to support each other that calls her to assist him. As well she can see severe financial consequences for her father unless she can resolve Michael’s issues. Michael and his partner, Simon To, have a successful franchising business in China involving noodle shops and 7-11 stores. They are given an opportunity to expand to a new development to be built amidst the burgeoning casinos of Macau. Unfortunately, they do not conduct due diligence into the venture and find they have become involved with members of a triad. Initially Ava seeks to resolve Michael’s problems on her own. The impossibility of a personal resolution is swiftly made clear and she calls on Uncle who gently but clearly chides her for not seeking his assistance. Ava had thought to avoid further building on the network of favours and personal commitments that revolve around Uncle. It had been presumptious on her part. Readers had known from other books that Uncle had some connections with a triad. This book sets out his deep participation. We also learn of the pyramid structure of a triad. Unlike earlier books the financial issues are relatively simple and do not need the expertise of a forensic accountant. The book becomes a rather conventional thriller in the last half of the book. The distinction is that it is a young woman who is the action hero. It was intriguing to see how Ava reaches out to former client, May Ling Wong, and the interaction with Michael’s fiancée and Simon’s wife. Chinese women are playing a far greater role in the financial affairs of families than previous generations. I enjoyed the book. It is easy to read. The story moves quickly. Ava is a more complicated personality than the average thriller hero. There is a ruthless element to her character. I do regret that Ava has moved from a skilled forensic accountant who must occasionally use her martial arts training to a predictable hero using violence to right wrongs. I hope not too, Bill. I like Ava as a protagonist who uses her skills and brains. Still, it sounds as though this book sheds some interesting light on Ava's family situation, and I think that rounds a character out. Thanks for your thoughts on this. This is about a pastor who, with his congregation, saved about 5,000 people during WWII. It sounds good to me. This has reminded me that I meant to try this series, after reading an earlier review by you. I must get on it! Moira: Thanks for the comment. You will not forget Ava when you read about her. She is also stylish.